This morning, NCL is proud to announce the launch of the 10 cents social media campaign. Our new pledge campaign aims to harness consumers’ collective power and to send a message to retailers that we American consumers really do care about the health and safety of workers overseas who manufacture our clothes. On April 24, in Bangladesh, the Rana Plaza garment factory collapsed and more than 1,100 people died. We have to do everything in our power to make sure that type of disaster never happens again. The Worker Rights Consortium has calculated that for $3 billion total, every factory in Bangladesh could be renovated and updated to meet basic safety standards, preventing such tragedies. Updates would include construction of proper fire exits or fire escapes, as well as installation of emergency lighting, safety equipment, and electrical rewiring. Recent events have demonstrated the devastation and death that are inevitable when factories do not have these safeguards. There is an estimated 7 billion individual garments imported every year from Bangladesh. A mere 10 cents tacked on to the price of each garment would generate $700 million a year – more than enough revenue to cover these necessary factory updates. While European countries are making moves to show their support for improvement, only two American retailers (PVH and Abercrombie & Fitch) have signed an accord agreeing to improve factory conditions for workers in Bangladesh. Other American retailers including Walmart, GAP, JC Penney, and others think American consumers would be unwilling to pay the extra 10 cents needed to keep thousands of workers out of harm’s way. Consumers need to SPEAK UP and let retailers know we are willing to pay 10 cents. 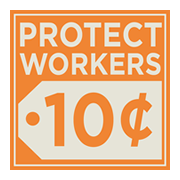 Sign a pledge that you will pay 10 cents more to protect workers. When consumers band together, they have amazing power to influence even the biggest corporation’s decisions. Let your voice be heard! Take the 10 cents pledge today!